The global metal powders for additive manufacturing market mainly depicts the presence of a highly fragmented and competitive vendor landscape, says Transparency Market Research on the basis of a newly published report. This is majorly due to innumerable players operating in this sector, who are fiercely competing with each other to gain maximum revenue. With new companies entering this sector on a regular basis, the competition is expected to increase dramatically during the upcoming years. Most companies are focused on increasing product manufacturing capacities and improving product quality. A lot of focus is being imparted on bringing about extensive innovations in the production techniques used to manufacture metal powders. 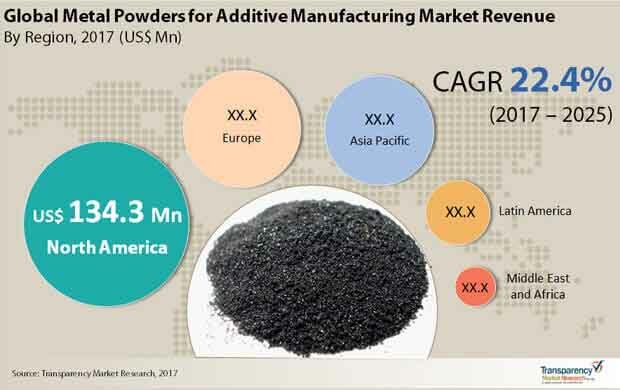 Participating in mergers & acquisitions, expansion of product portfolios, and achieving product differentiation also are key schemes implemented by many businesses in the global metal powders for additive manufacturing market. Hoganas AB, Rio Tinto, Arconic Inc., Hitachi Chemical Co., Ltd., Renishaw Plc., Carpenter Technology Corporation, Miba AG, Sandvik AB, BÖHLER Edelstahl GmbH & Co KG, Praxair Technology Inc., Metaldyne Performance Group Inc., GKN Plc., Aubert & Duval, and ATI Powder Metals, are key players operating in the global metal powders for additive manufacturing market. According to market experts, this market had gained revenue worth US$310.6 mn in 2016, and is further expected to grow up to US$1,783.9 mn by 2025. This growth is projected to occur at a stellar CAGR of 22.4% during the forecast period from 2017 to 2025. Highly progressing automotive and aerospace industries have mainly been responsible for driving the global metal powders for additive manufacturing market. This is mainly due to a great need of the additives made from metals in these industries, owing to their advantageous properties such as corrosion resistance, high error resistance, and notable tensile strength. A growing demand for highly advanced materials such as titanium is also stimulating the global metal powders for additive manufacturing market. From an overall perspective, as the need for high quality machinery parts in the aerospace and automobile industry has increased, the use of additives derived from metal powders also has experienced a surge. However, in spite of these positive scenarios, the global metal powders for additive manufacturing market is substantially being hindered by a few factors. High costs required to set up systems for additive production, as well as expensive research and development activities undertaken for the same is greatly hampering the market’s growth. Many regions might depict a lack of trained professionals and a shortage of equipment that is required to manage the additive manufacturing activities. These too are significant factors that are posing as key restraints to the global metal powders for additive manufacturing market. Nevertheless, the picture is soon expected to change as numerous companies are gradually introducing cost-effective additive manufacturing methodologies and processes, which could offset most of the restraints affecting this market. With new companies entering this sector on a regular basis, the competition is expected to increase dramatically during the upcoming years. Highly progressing automotive and aerospace industries have mainly been responsible for driving the global metal powders for additive manufacturing market.